Has modern scholarship debunked the traditional Christ? Has the church suppressed the truth about Jesus to advance its own agenda? What if the real Jesus is far different from the atoning Savior worshipped through the centuries? In The Case for the Real Jesus, former award-winning legal editor Lee Strobel explores such hot-button questions as: * Did the church suppress ancient non-biblical documents that paint a more accurate picture of Jesus than the four Gospels? * Did the church distort the truth about Jesus by tampering with early New Testament texts? * Do new insights and explanations finally disprove the resurrection? * Have fresh arguments disqualified Jesus from being the Messiah? * Did Christianity steal its core ideas from earlier mythology? Evaluate the arguments and evidence being advanced by prominent atheists, liberal theologians, Muslim scholars, and others. Sift through expert testimony. Then reach your own verdict in The Case for the Real Jesus. About "The Case For the Real Jesus"
Customer Reviews For "The Case For the Real Jesus"
The person of Jesus has come under attacks from revisionist historians and in popular literature. In this helpful book, Lee Strobel very ably and masterfully addresses six contemporary challenges. These are: (1) ancient documents, other than the Four Gospels, portray a radically different Jesus; (2) the Christian church has tempered with the New Testament texts and hence they cannot be trusted in their portrayal of Jesus; (3) Jesus' resurrection can be explained in other ways; (4) beliefs about Jesus were copied from pagan religions; (5) Jesus did not fulfill the prophecies of the Messiah and hence was an imposter; and (6) people should be free to pick and choose what they believe about Jesus. 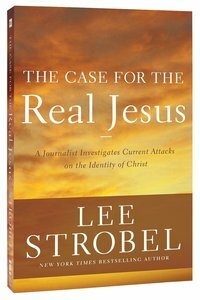 Based on careful research and meticulous interviews with respected scholars, Strobel responds to all these challenges and argues that Jesus, as portrayed in the Gospel accounts and historically proclaimed by the Christian church, is the real Jesus! This book is a must-read for both skeptics and also believers who need ammunitions to respond to contemporary challenges to the person of Jesus. Highly recommended!